The long awaited day. Finally my girlfriend has tied the knot. Bon is one of the few friends I grew up with. We shared almost every secrets together, exchanged gossips on the cutest guy in school, worked part-time during school holidays and did alot of silly naughty things. We literally watched each other grew up, saw the guys we've dated and finally settling down. I cannot believe we've grown so old!!! 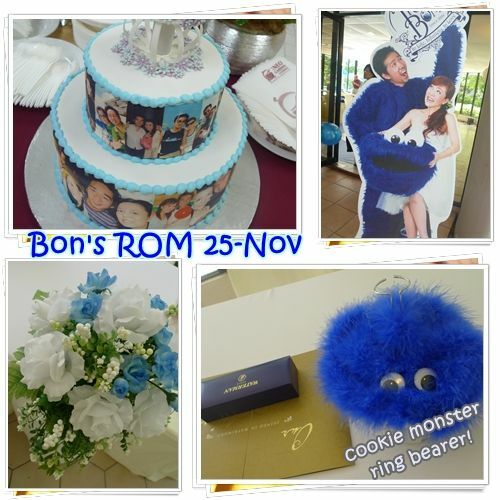 Obviously, the gal has a serious obsession with Cookie Monster since secondary school days. Everything was in blue! From the flowers, to the carpet (yes, people use red carpet but she used blue! ), to the balloons, cake and even the ring bearer! Very innovative indeed. Congrats babe! Looking forward to your customary one year later! The D&D was nothing to rave about. I never really relish the idea of stand-up cocktails as everyone was everywhere and in a mess! However, having to go for an event meant that I needed a new dress to wear. Of course, also an excuse for myself to shop shop shop! Back to the D&D. I was aiming for the iPad that I was literally chanting under my breath. In the end I won a "$100 NTUC voucher" *gua gua gua* No iPad for my kid but still have free milk. You look nice in that dress. Not really loose on top.